Despite being so short on time this week, I did manage to cook dinner every single day and I've gotta admit, I'm proud of myself. In this day and age, it's so easy to escape the kitchen and order-in or drive-thru a fast food joint so that our bellies can get full and we can go back to doing what we were doing. 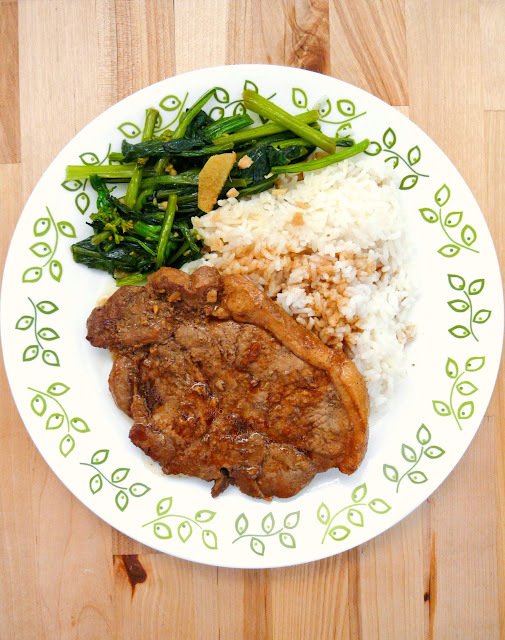 But with a little pre-planning, I've found that it's definitely possible to put together quick and simple dishes, like these delicious five-spice pork chops which we ate for dinner last night. No wait, delicious is an understatement. 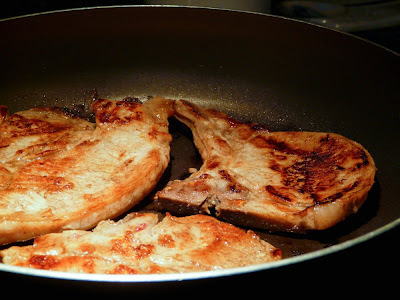 These pork chops were the bomb -- flavorful and tender. I served them with plain steamed rice to soak up all that delectable sauce and some yu choy (chinese greens) that were sauteed with garlic and sliced ginger. All in all, an awesome weeknight dinner. Note: Five-spice powder is readily available at Asian grocery stores. If you don't have access to five-spice powder, try putting together your own five-spice seasoning with this recipe. 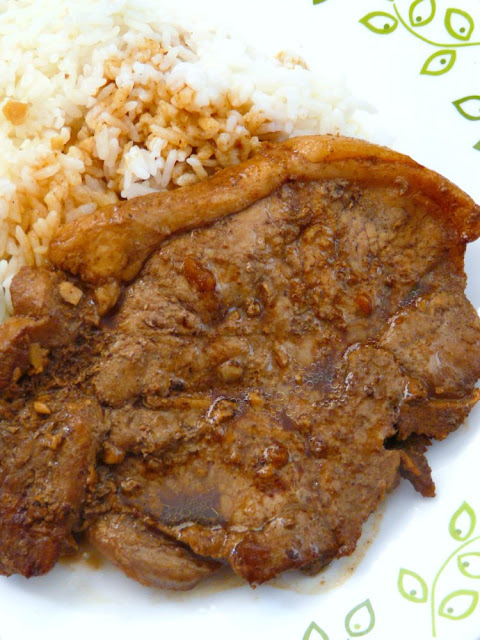 Rinse the pork chops under tap water and pat dry with paper towels. Lay them in a shallow glass dish in a single-layer. 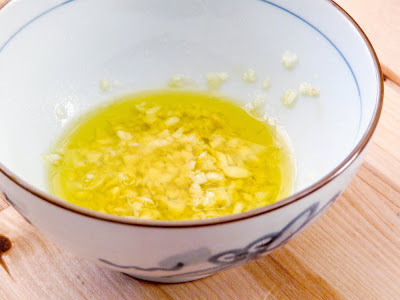 Combine the minced garlic and extra virgin olive oil in a small microwave-safe bowl. Microwave the mixture for about 25 seconds, just enough to heat the garlic so that it will release its essence and infuse the oil. 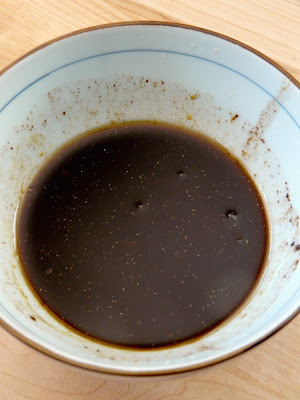 Add the five-spice powder, soy sauce and honey to the bowl and whisk until well mixed. 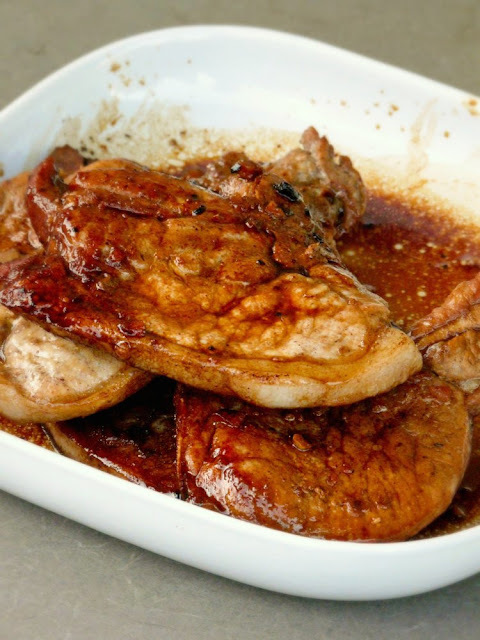 Pour the marinade over the pork chops, turning the chops over a few times so that they are thoroughly coated. 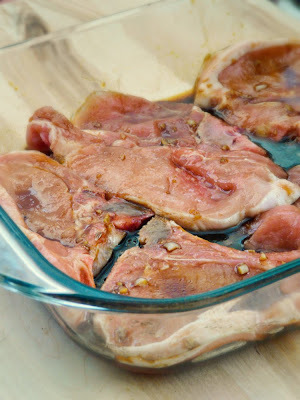 Cover and let the pork chops marinade in the refrigerator for at least one hour. When ready to cook, heat a frying pan over high heat. Sear the chops quickly on both sides until browned then cover the pan with a lid and reduce heat to low. Cook the chops on low heat for about 10 to 15 minutes (turning them over once) to allow the meat to soften. When the pork chops are done, transfer to a platter and pour all the juices from the pan over them. Serve and enjoy! Pork chops enjoying their five-spice bath. Here they are being quickly seared over high heat. Fresh off the frying pan with their drippings/juices. 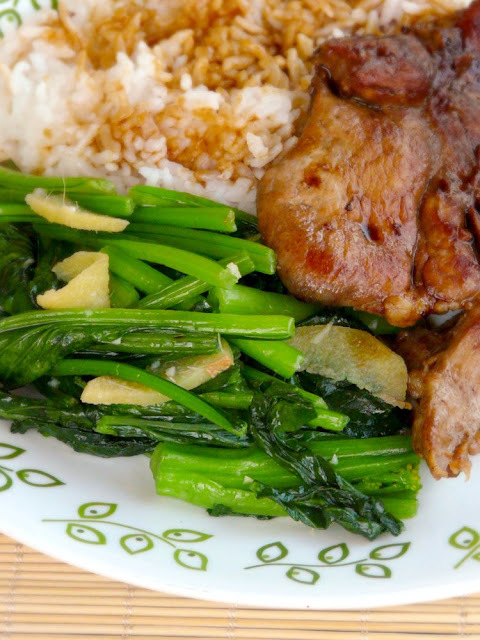 Served with yu choy sauteed with minced garlic and sliced ginger. Bursting with flavor and so good with rice!